Eight toes in one picture. Antiquity is a tantalizing thing; Jurassic antiquity is one of the more alluring, especially if you’re standing on a spot where dinosaurs once patrolled the land. High in the La Sal Mountains, above 8200 feet, lies a trackway of these old creatures. Past a jerry-rigged stick-and-wire gate keeping cows out, the path meanders through oak scrubland to an open area of flat rock. The instant I set foot upon it, my brain shouted YOU HAVE SEEN ROCK LIKE THIS BEFORE AND IT CONTAINED DINO TRACKS. And, sure enough, a minute more brought me to the impressions. They were large. VERY large. 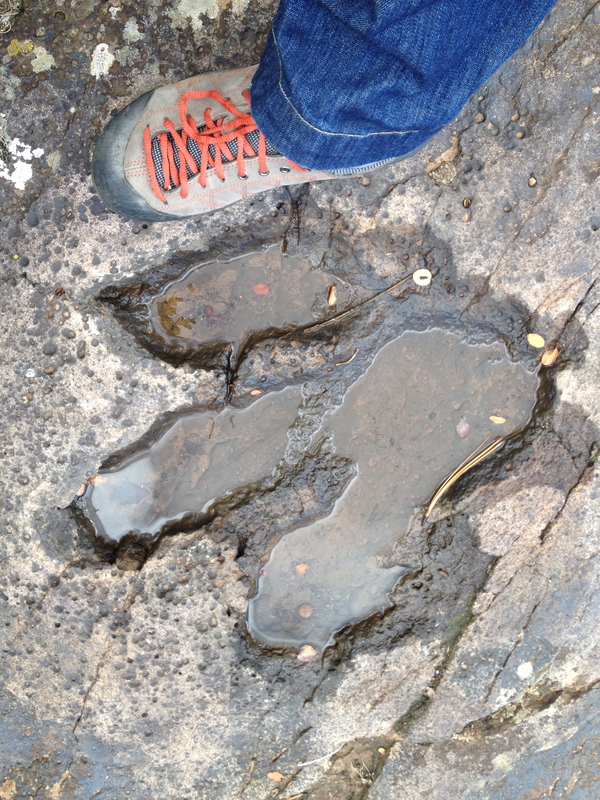 Bearing water from recent rains, the tracks crossed each other, great beast-feet striding in various directions. Putting my shoe next to one of them, I couldn’t help but speculate about its height… two or three Kathryns tall? What color was its skin? Did it make a snuffling noise as it walked? How did it hold its tail? Did others scatter ahead of it? Were there bigger ones than these? Were babies unutterably cute? What plants surrounded the Jurassic travelers in this locale? What kind of dinosaurs made the prints??? My hand span is 8 inches, pinky to thumb. Not having any answers for my set of curious questions, I pressed my nose against the trunk of a stately Ponderosa pine, inhaled its unmistakable vanilla scent, and recalled how much I love the West. Every new day of this wondrous life brims with things to explore and discover; I am blessed, so very blessed. 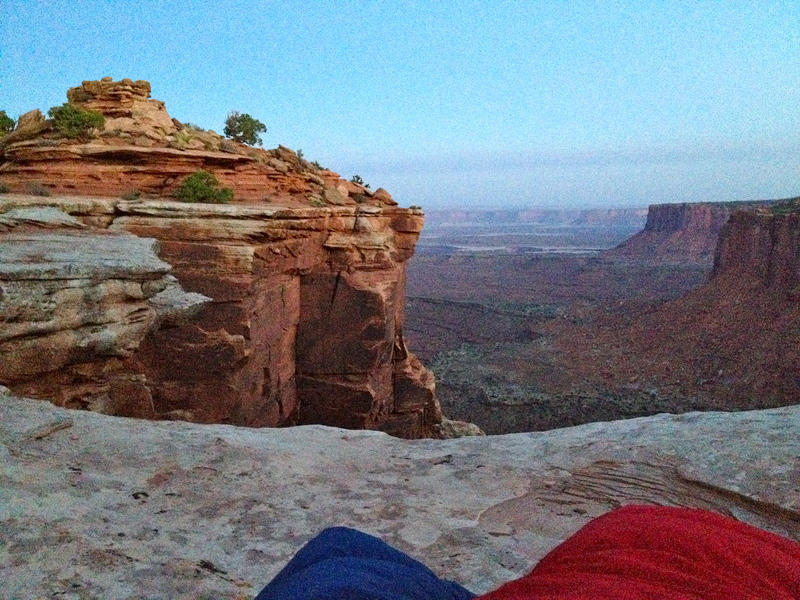 Lay out your sleeping bags a few feet from a canyon edge. Wake up to this pre-dawn view, with bats and chipmunks for company. Sometimes I get the urge to just go sleep in the wild. Doesn’t really matter where, as long as it’s somewhere “out there” where I won’t see anything man-made. Campgrounds are too civilized, too ‘safe,’ too peopled. I want to be away from it all, stretched out full-length on the earth. I want crickets to sing me to sleep; I want the breeze to kiss my face while I dream. Here’s how it happens: I grab a sleeping pad and bag, a water bottle, a headlamp, a Clif Bar, and (optionally) a friend, and go find myself an Adventure Sleep Spot. Experiencing the Milky Way for my ceiling, with shooting stars puncturing holes in the night, is a treat that far outweighs any discomfort or inconvenience. Waking in an unusual place often elicits an involuntary chuckle at finding myself not in a bed, not in a house. After my first season in Utah, Wildophilia gripped me. I appear to have the progressive variety of this condition; surely a normal person wouldn’t be looking at all the high rock formations in this park and wondering what it would be like to wake up on top of them. Or… would she? The crack running up the center of Owl Rock is our route to the top. Perched on a smallish rounded knob one hundred feet above the ground, my hard-won vantage point provided uncommon views of Arches National Park. The camera was down below; I hadn’t trusted myself to get it up the climb intact. I’d etch these sights in my brain instead of on a memory card. 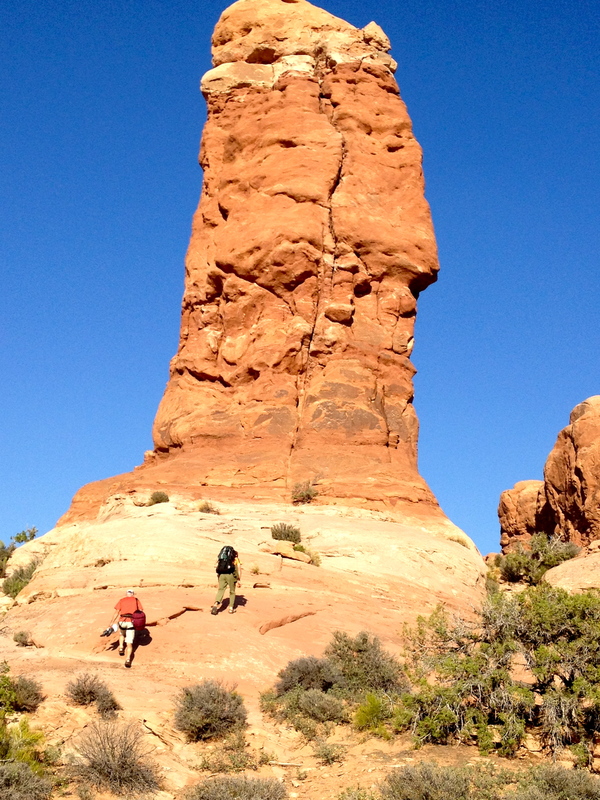 This climb was my first desert tower — a free-standing sandstone spire rated 5.8+, not overly difficult. Craning my neck, I watched Ranger Bobby and Ranger Chris (both excellent climbers) glide up it without much struggle. Each paused at a few sketchy spots, figuring his next move; I knew I was in for an ascent that was at the edge of my ability. But that’s how I like it. Bobby goes first, placing protective gear which will hold him in case of a fall. 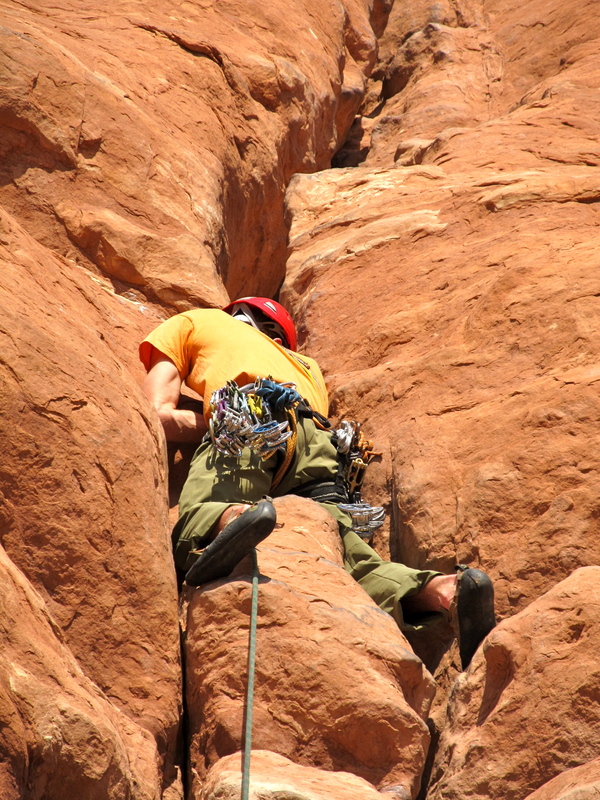 When climbing is done well, it resembles someone dancing up a slab of rock with grace and poise and balance. When *I* was dragging myself up Owl, onlookers saw a desperate individual jamming her hands in any available crack while breathing rapidly and struggling to place a foot where it wouldn’t slip. My sympathetic nervous system (‘fight or flight’) freely dispensed adrenaline, elevating my pulse, dilating my pupils, drying my mouth of all spit. Seventy feet up, bulbous outcroppings taunted me: “Let’s see you get past.” Gr-r-r-r. I refused to look down, couldn’t see my companions belaying me from above, and when the words “I can’t” formed on my lips, I recalled my dad’s translation of that as “I won’t.” OH YES I WILL JUST YOU WATCH, I said under my breath, and mentally willed myself to inch up the scary bulges one calculated move at a time. Two-thirds of the way up, on the left edge, I’m rappelling from the summit. It’s really the only way down. 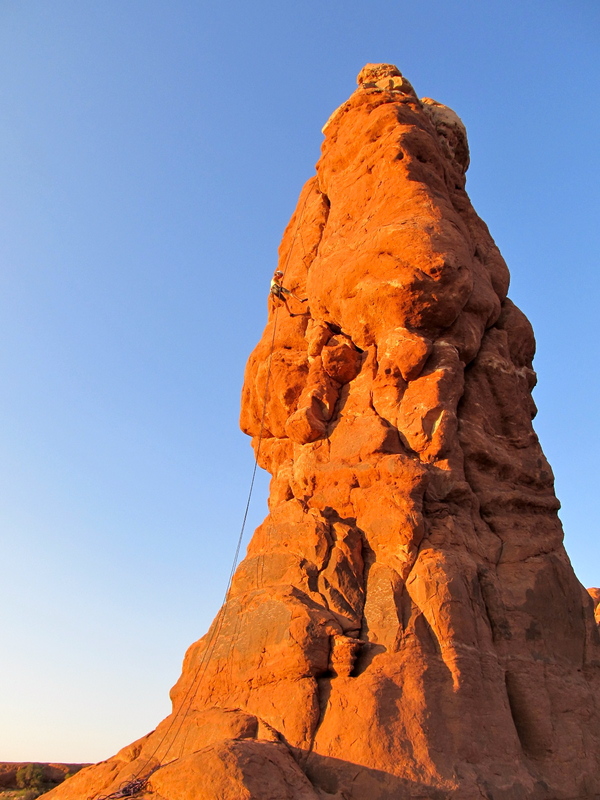 The summit was worth it, a reward that fewer than 0.1% of Arches visitors ever earn. An hour before sunset, surveying the glowing red kingdom, I forgot about the clawing, scraping, grunting pulls and pushes that had unceremoniously gotten me there. In the end, it doesn’t matter; nobody was grading me. My bruises will fade before my memories do. What’s important to me: I SAT ATOP OWL ROCK. Leave a comment: what hard thing have you done that was so very worth it? 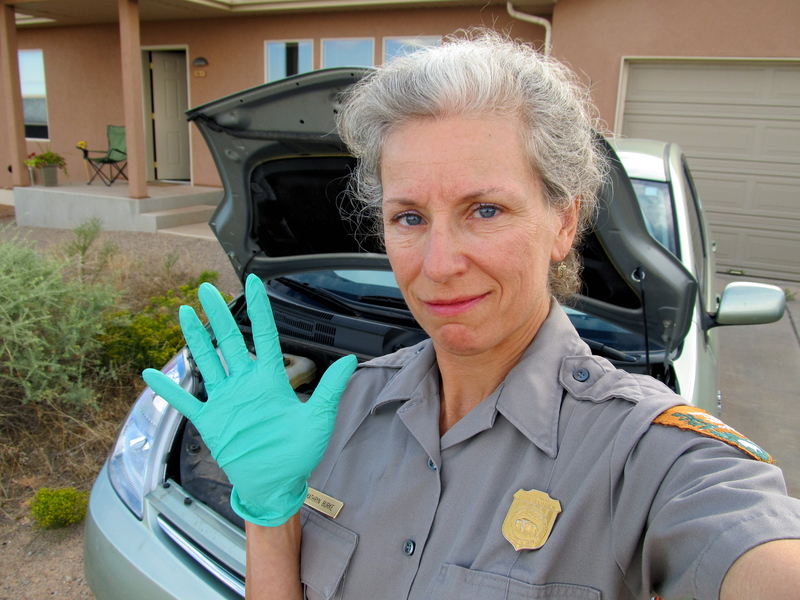 Gloved up and ready to remove packrat nesting material from my car’s engine. The unmistakable rodent sound came from within my car’s engine, audible as I sat watching my umpteenth sunset from the front porch. I heard it again, sighed, wandered over to pop the hood open, and found what I least wanted to see: nesting material, freshly-harvested greenery, piled behind one headlight. Poop pellets confirmed that it was indeed Neotoma albigula, our local packrat. Last season, a co-worker spent $1200 repairing her rodent-gnawed vehicle. Twelve hundred dollars! 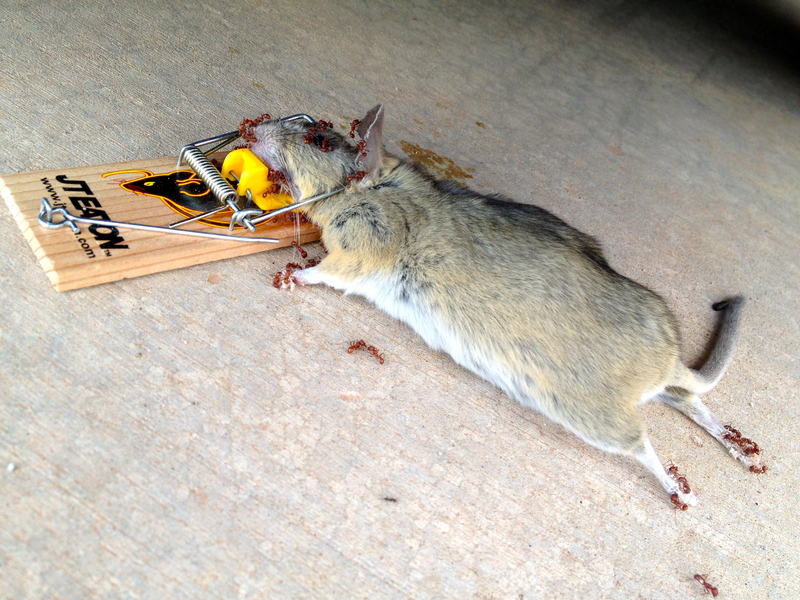 I had no mothballs or peppermint oil (two alleged deterrents), so I did something rash: set a mousetrap under the car. Baited it with the only thing I had, which was Biscoff spread. Caught me a 13″ (nose to tail) half-pounder. I apologize if that sounds un-rangerish, I really do. Normally I live and let live. But not when my car is at stake, and this critter had already staked its claim. Ants, feasting. Bypass this photo if you are squeamish about dead things. I made it small on purpose. Hantavirus is the other concern. Several deaths have happened recently from this rodent-transmitted disease at Yosemite National Park, and in the NPS we don’t take safety issues lightly. All rodent clean-up involves latex gloves, bleach water, and (if necessary) mask to prevent inhaling the virus. I’ve returned the carcass of the packrat to the back yard, ensuring that the circle of life continues. It’ll make good food for some raven. Have you been the victim of any rodent damage? Leave a comment. 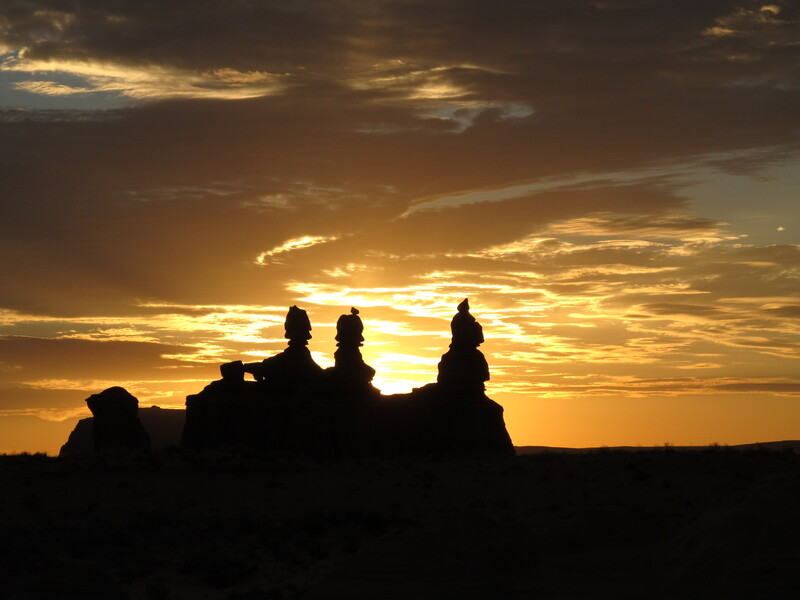 Moments after sunrise, eroded sandstone figures resembling chess pieces stand guard on a mesa in Utah. Death of a goblin. For scale, Chris. In the 1920s, cowboys searching for their cattle happened upon a few secluded valleys sheltering thousands of sandstone goblins. This small tract of land in the middle of nowhere in southeastern Utah was first photographed in 1949, and the public became enamored of its lumpy beauty. 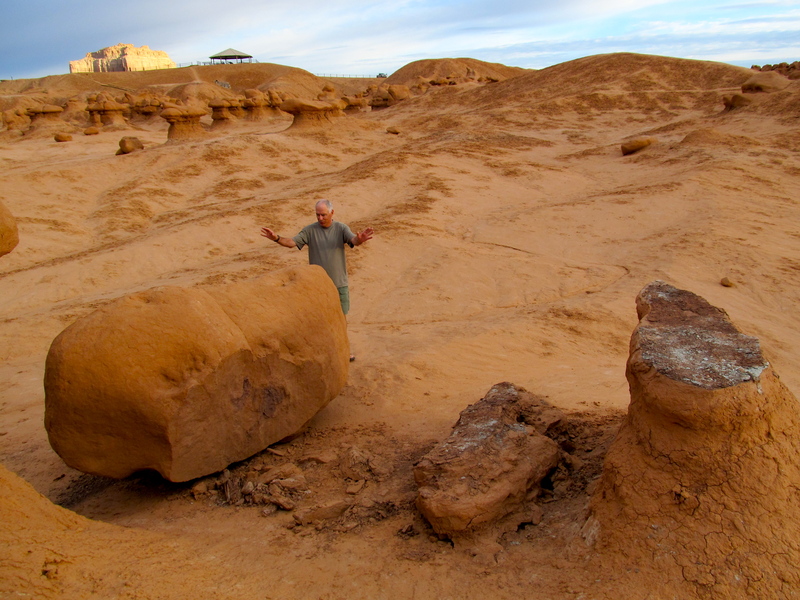 Differential erosion sculpted the fantastical shapes that inhabit Goblin Valley State Park. If you’re on your way to anywhere nearby, enjoy the delight of roaming among the mushroom-shaped pinnacles — which look their finest in low-angle light. Goblin Valley, just as the sun first kisses it. What ARE those depressions in the rock?!? Click to enlarge. Hiking alone always lights up new areas inside my brain. 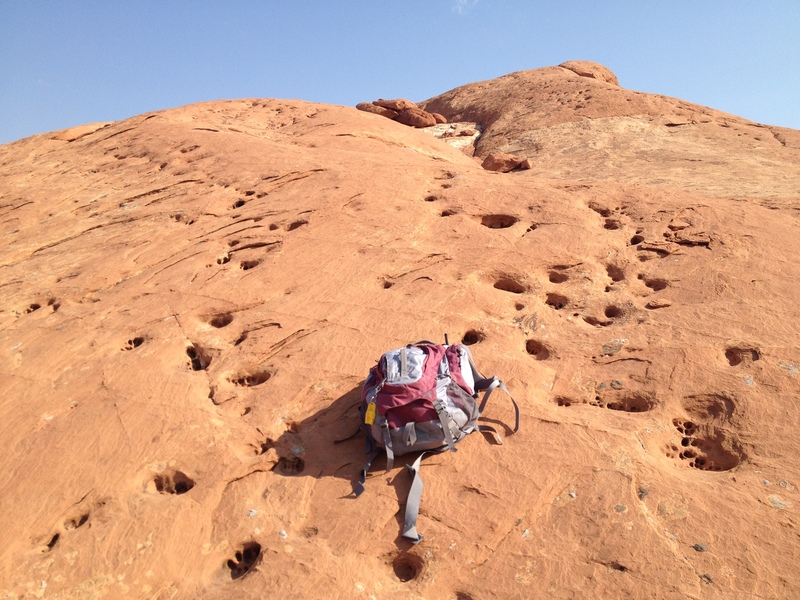 In a backcountry area of the park recommended to me by a law enforcement ranger, finding my own way across pathless sandstone, I was keenly aware that I was the only human out this way. I had what I needed: water, Clif bar, hat, radio, spare battery, whistle — no need for a map since I was following the edge of a giant hole in the earth. 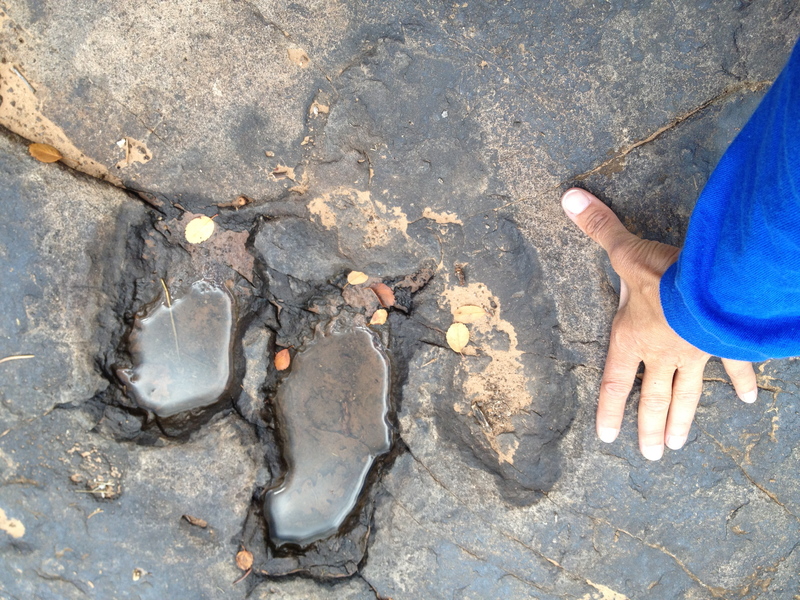 Finding dinosaur tracks would be a Very Cool Event. Wary that I was wanting that badly enough to distort my objectivity, I took some photos and headed back to the visitor center. One permanent ranger was skeptical, reminding me that no tracks could have survived the forces that made a two-mile-wide crater. Another permanent ranger had a sparkle in his eye and whispered, “I think I’ve heard that there ARE dino tracks out that way.” Which is just the way I must leave it. I’ll probably never know. Mystery is very, very good.